The Regional Universities Forum for Capacity Building in Agriculture (RUFORUM) in partnership with the African Women in Agriculture and Research Development (AWARD) aims at strengthening improved gender practices within the RUFORUM Network and jointly organizing leadership and management training courses. A gender awareness leadership and management training conducted annually is one of the activities under this partnership. It is within this context that AWARD in collaboration with RUFORUM conducted a Leadership Programme for Agriculture Research and Development (LEPARD) training workshop at Bingu International Conference Center, Umodzi Park Hotel in Lilongwe, Malawi on 4 -9th July 2016. This training workshop followed other two LEAPARD courses earlier hosted in Nairobi (2014) and Uganda (2015), respectively under the same RUFORUM/AWARD collaboration geared towards building capacity in gender mainstreaming in Africa. Specifically, the just concluded LEPARD training in Malawi drew participation from 11 Africa countries – namely Ethiopia, Ghana, Kenya, Malawi, Mozambique, Nigeria, Rwanda, South Africa, Tanzania, Uganda, and Zambia. LEPARD focuses on strengthening Agricultural Rural and Development Institutions through provision of role model leadership and innovative expert facilitation based on core values of inclusiveness, performance, transparency, integrity, and efficiency. The course targets mid-level management staff from Agricultural Research and Development Sector such as National Agriculture Research Systems, Universities, and International Agricultural Research Centres (IARCs). The LEPARD training in Malawi was officiated by Dr Jean Kalilani, the Minister of Gender, Children, Disability and Social Welfare. In her remarks, Dr. Kalilani thanked the organisers for the life changing course. 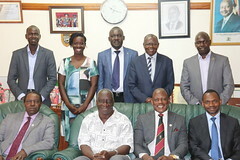 She indicated willingness by her Ministry to partner with AWARD and RUFORUM to organize a similar training for female scientists and parliamentarians in Malawi. AWARD representative Ms Dorothy Mukhebi, the Deputy Director Programmes, valued the high level presence, commitment and support from the Malawi Government and Lilongwe University of Agriculture and Natural Resources (LUANAR) during the training. AWARD has provided a total of 42 fellowships to Malawi for the past years in building the capacity of scientists. RUFORUM was represented by Dr Mary Shawa, the Principal Secretary at the Malawi Ministry of Gender, Children, Disability and Social Welfare who is also a member of the RUFORUM Board Executive Committee, and Ms Sylvia C. Mkandawire – Training Officer at RUFORUM Secretariat. Minister Kalilani on behalf of the Government of Malawi appreciated the long term partnership with RUFORUM and LUANAR in supporting capacity development agenda in Malawi and Africa at large. The RUFORUM representative, Mrs Mkandawire appreciated AWARD’s contribution in mainstreaming gender tools and practice within the RUFORUM Network. This has helped in building capacity of the Network to further champion gender inclusiveness in all its activities. In addition to the individual skills building and institutional transformation, the LEAPARD training courses have been one means for supporting staff short mobility across the continent and providing an active platform for networking and cross- learning encouraged by the RUFORUM’s mode operandi.